Immunohistochemical analysis of paraffin-embedded human spleen tissue slide using 15303-1-AP( GBP1 antibody) at dilution of 1:200 (under 10x lens). 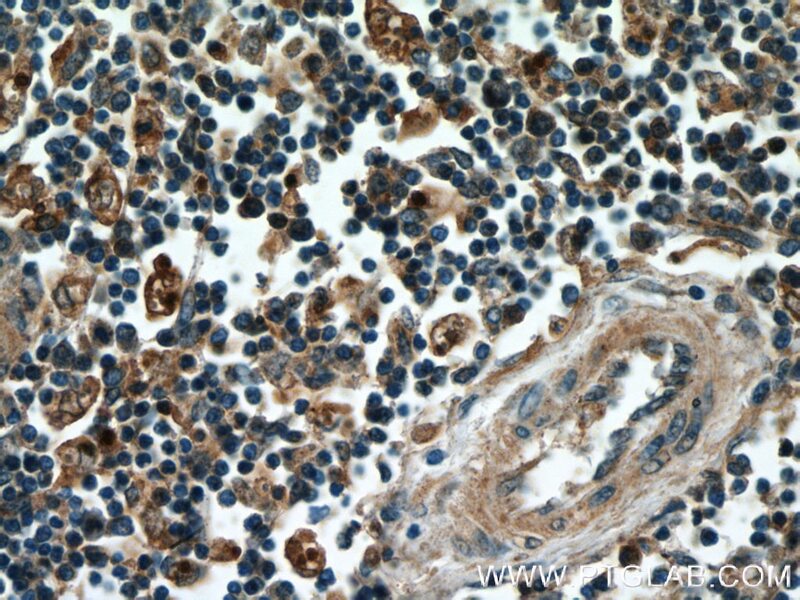 Immunohistochemical analysis of paraffin-embedded human spleen tissue slide using 15303-1-AP( GBP1 antibody) at dilution of 1:200 (under 40x lens). IP Result of anti-GBP1 (IP:15303-1-AP, 4ug; Detection:15303-1-AP 1:600) with human placenta tissue lysate 4000ug. 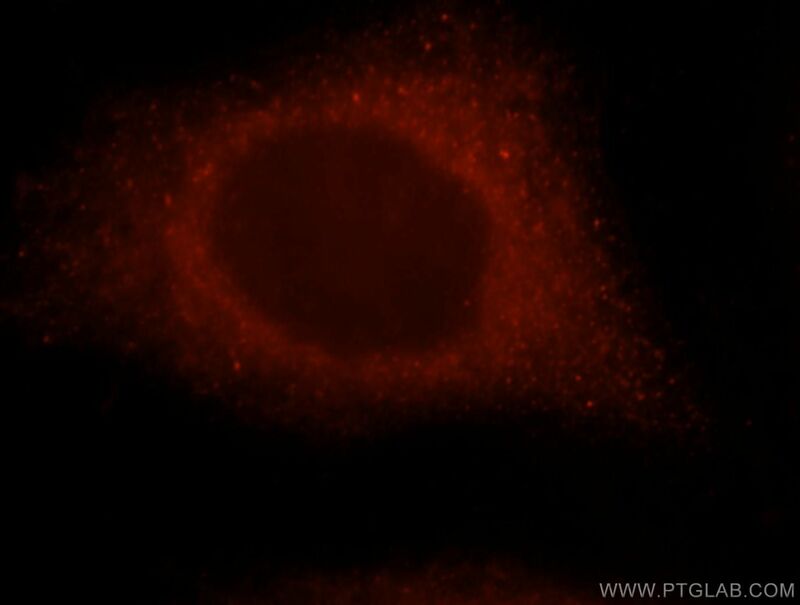 Immunofluorescent analysis of MCF-7 cells, using GBP1 antibody 15303-1-AP at 1:25 dilution and Rhodamine-labeled goat anti-rabbit IgG (red). Guanylate binding protein 1 (GBP1) belongs to the dynamin superfamily of large GTPases. The expression of GBP1 is induced by interferon and GBP1 is characterized by its ability to specifically bind guanine nucleotides such as GMP, GDP, and GTP and its ability to hydrolyze GTP to GDP and GMP. What is the molecular weight of GBP1? The molecular weight of GBP1 is 68kDa. What is the cellular localization of GBP1? GBP1 is predominantly cytosolic, but under certain conditions is farnesylated and associated with intracellular membranes such as the Golgi (PMID: 15937107). What is the role of GBP1 in immunity? 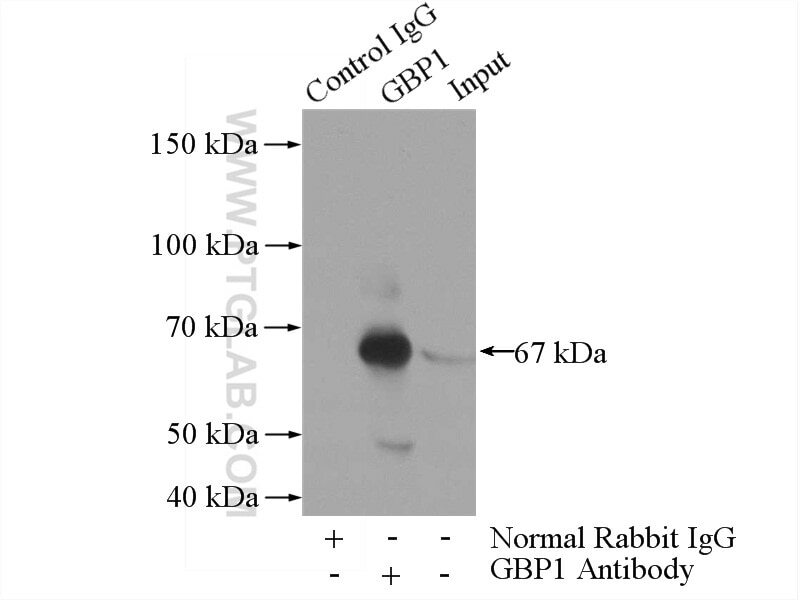 GBP1 is induced in response to type I and type II interferons and as such plays a role in protective immunity against a spectrum of intracellular pathogens ranging from viruses to bacteria to protozoa, such as negative-strand RNA Rhabdovirus, vesicular stomatitis virus and the positive-strand RNA Picornovirus, encephalomyocarditis virus in cultured cells, the inhibition of Chlamydia trachomatis, Toxoplasma gondii, and Salmonella enterica (PMID: 21142871). These anti-pathogenic functions involve the recruitment to vacuolar compartments for the destruction of the pathogen, the assembly of innate immune complexes such as the inflammasome, or the initiation of autophagy. What is the role of GBP-1 in colorectal carcinoma? In colorectal carcinoma (CRC), the presence of tumor-infiltrating T helper type 1 (Th1) cells participates in anti-tumoral responses and an improved clinical outcome (PMID: 17008531, 20927778). Interferons promote the Th1 immune response, as well as GBP-1 expression. 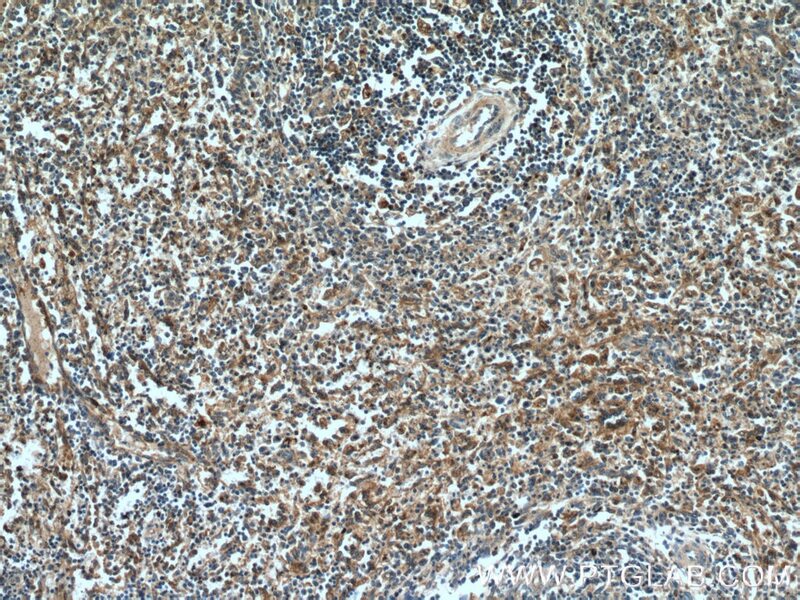 In CRC, GBP-1 expression acts as a tumor suppressor, where inhibition of tumor growth by GBP-1 is the result of its strong antiangiogenic activity as well as its direct anti-tumorigenic effect on tumor cells and is correlated with a better outcome (PMID: 23042300). GBPs Inhibit Motility of Shigella flexneri but Are Targeted for Degradation by the Bacterial Ubiquitin Ligase IpaH9.8.